It's time to celebrate! New job, new home, a birthday, a new love? This fresh flower arrangement has you covered. 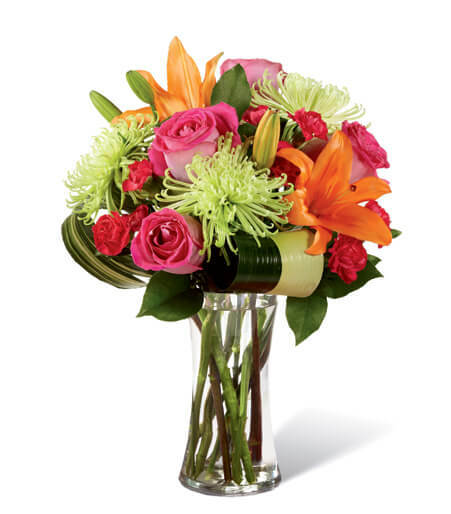 Hot pink bi-colored roses, orange Asiatic Lilies, green Fuji Chrysanthemums, hot pink mini carnations, tropical leaves, and lush greens are brought together to impress, presented in a clear glass vase. Bright, beautiful, and ready to get the party started, this bouquet creates a unique surprise to absolutely delight your recipient with each sunlit bloom.